Evan has gone back to DC and will shortly be headed out on a retreat. Before he left we had a conversation about the contents of this blog. One of his brother novices pointed out that — from the parent’s perspective — there’s stuff to write about at the beginning of seminary and stuff to write about at the end. In between are classes and seminars and apostolates and service. Maybe not the most riveting content. There’s some truth to that, but I expect we’ll have a few interesting tidbits to pass along in the coming year. And, this blog is as much about us s it is about the seminary experience. We, too, are living through our faith journey which is a continual conversion experience. The nice thing about conversion is that it’s an experience we all get to share with one another. And that brings me to the topic of this post; a brief report on a great book about a personal conversion. Evan met Richard while on his apostolate in Austin and gifted me with an autographed copy of the book for my fiftieth birthday. As a convert myself, the subject matter drew me in and the beautiful, vivid language held me to the end. Cole opens the book with a trip he took to a monastery for the purpose of rest and relaxation. What he found, though, was a spiritual director. She tells him, “You are being created, very deliberately, at God’s own pace. It’s like being pregnant or cooking. If the soup takes three hours to make, you can’t rush it. Just wait. And while you’re waiting, you have to trust. You can’t presume to know what God is doing. That’s not faith; it’s a false security. You simply have to have faith.” Like a kid in an adventure story who discovers a fragment of a pirate’s treasure map, Cole began his search. Along the way, he flashes back to his younger years, his struggle with alcoholism, and his desire to be significant. Nothing he turned to seemed to satisfy his hunger, until he began to discover Christ. His wife had been raised Catholic and had parted company with the church, so they sought compromise solutions by joining other communities. 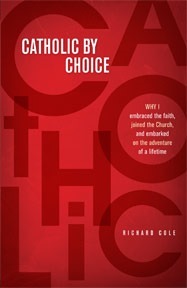 Even as they attended an Episcopalian parish, Richard also went to daily Mass. He read the Bible daily, hoping to find some answer and he prayed and encountered Jesus. It really is a story of an inch-by-inch conversion. Cole tried to be good enough for God. A recurring theme in the book is his need to have the “right” answers and to be seen as the smart one — an impulse I’m entirely too familiar with in myself. In the end, though, he has to let go and enter fully into relationship with God. Cole’s honesty throughout the book is engaging and there’s nothing I can write here that will truly do it justice. So, I won’t try. I’ll end with one more quick quote and a relevant video. Cole has joined the RCIA program at his parish and tells of a classmate who approaches the task of conversion like a doctoral candidates on the fast track. She attacks the problem of faith with books and a copy of Ignatius’ Spiritual Exercises. She asks the RCIA director for the best way to pray as if there is a universal answer that will fit all people in all situations. This entry was posted on June 22, 2014 by kevinleec in Reflections, Spirituality and tagged book, conversion.